^ South Sudan quashes coup attempt, says President Kiir. BBC. 2013-12-16 [2013-12-18]. ^ South Sudan: The hunger caused by bickering politicians. BBC News. 2014-07-03. ^ Riek Machar: Don't Let 'Stupid' Comment Block South Sudan Talks. VOA. 2014-06-19. 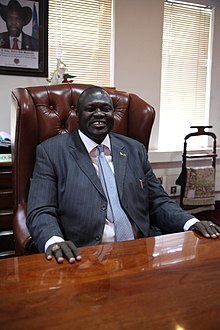 ^ 4.0 4.1 Riek Machar, the former rebel fighter ready for a new battle. theguardian.com. 2013-07-04. ^ Riek Machar, the former rebel fighter ready for a new battle. theguardian.com. 2013-07-04. ^ What Triggered the Kiir-Machar Rift in South Sudan?. VOA. 2014-01-09. ^ 马沙尔返回朱巴就任第一副总统 潘基文秘书长欢迎南苏丹和平进程的新进展. 聯合國新聞. 2016-04-26. ^ South Sudanese Rebel Leader Returns to Juba to Celebrate New Peace Accord. VOA. 2018-10-31.